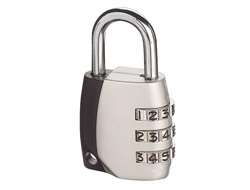 We have always offered padlock printing to customers with very large orders. However, the minimum order quantities were very high and lead times were at least 12 weeks from factory. With that in mind we have now shipped in a range of unbranded locks, held in our warehouse in the UK, to be printed on demand! We used a process called Tampo Printing which is the same as you see on your keyboard, iPod, and any other electrical device. It delivers a high quality, durable finished to a maximum of 4 colours. 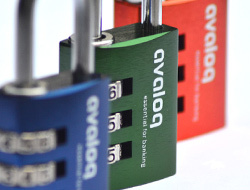 A light weight aluminium combination padlock with a large printable area. Available in two colours and ideal as a high quality lock to be branded and then resold or as a promotional giveaway. A low cost but attractive 3 dial combination padlock with a relatively small printable area ideal for website addresses, short messages or some logos if longer than they are tall.